Get instantly glowing and flawless looking skin with VLCC's Gold Facial Kit and Insta Glow Bleach Combo that has been specially designed to hydrate, rejuvenate, detoxify and deeply nourish your skin. 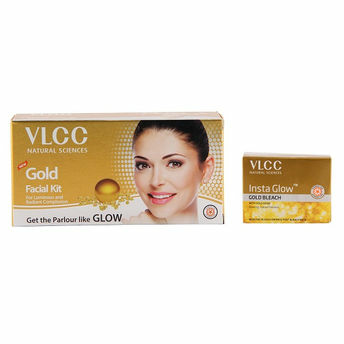 Getting parlour like benefits from the comfort of your home is now an easy task with the VLCC Gold Facial Kit. This complete facial kit by VLCC is a luxurious facial that improves skin's hydration and metabolism, prevents premature ageing, removes pigmentation, blemishes revealing radiant, luminous and youthful complexion. The kit is enriched with 24-carat pure gold particles to replenish the lost shine of your skin. It moisturizes your skin and helps restore the pH balance. The VLCC Gold Facial Kit exfoliates dead skin cells and gives your skin a rejuvenated feel. Get brighter looking skin using the VLCC Insta Glow Gold Bleach. The Insta Glow Gold Bleach gold bleaches the facial hair to even the skin tone in a simple three-step action. The energy stored in the precious element gold with its wholesome curative powers to the skin makes the skin look radiating and glowing. The bleaching powder gets absorbed with the cream, and the pre-and post bleach packs are good on the skin which gives an instant glow on it. This product contains a Pre-bleach gel, bleach cream, activator and a post bleach pack. Explore the entire range of Combos @ Nykaa available on Nykaa. Shop more VLCC products here.You can browse through the complete world of VLCC Combos @ Nykaa .